Speedy, powerful and articulate, the Jazz Bass quickly carved out a niche for itself when it was released in 1960. The 2017 Limited Edition American Professional Jazz Bass combines modern features with a stunning figured maple top to create an instrument that looks as beautiful as it sounds. 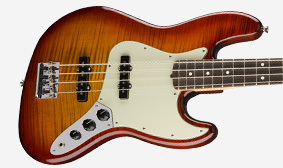 The brand-new V-Mod single-coil Jazz Bass pickups use a carefully selected blend of alnico magnet types for balanced tone with authentic Fender sonic DNA. Designed for comfort and performance, the slim modern “C”-shaped neck profile feels just right nestled in your hand while the 20 narrow-tall frets provide a familiar playing feel and perfect intonation. 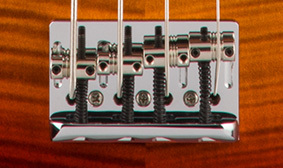 The four-saddle HiMass™ Vintage string-through-body bridge features nickel-plated brass saddles for a touch of extra ‘zip’ in the tone. A fantastic tonewood long used by Fender for its electric guitar bodies, alder is noted for bright, balanced and resonant tone with pronounced upper midrange, excellent sustain and sharp attack. This limited-edition J Bass is capped off with a gorgeous figured maple top dripping with classic Fender vibe. This instrument features a modern quartersawn neck designed for comfort and performance, with a slim, modern “C”-shaped profile (the shape of the neck in cross section), 9.5” fingerboard radius and narrow-tall frets. 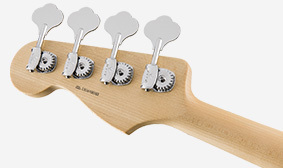 A quartersawn neck offers gorgeous looks and enhanced rigidity for a premium playing experience. 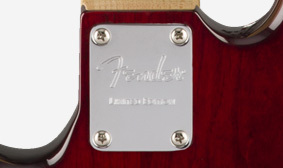 V-Mod Jazz Bass pickups are modified versions of our classic vintage pickup designs. These single-coil pickups use alnico 5 magnets on the treble side and alnico 2 on the bass side to deliver classic tone with all the vintage warmth and crisp, clear sound that made Fender a legend. 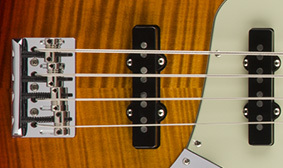 The four-saddle string-through-body HiMass bridge provides the classic look, feel and tone of traditional Fender bass bridges and also boasts rock-solid intonation and excellent sustain. 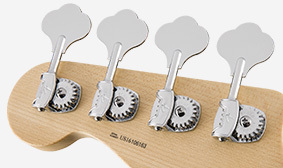 This bass feature smooth-turning vintage-style tuning machines with thin, flat “paddle” keys and stamped with the classic stylized Fender “F”. Tapered posts help anchor bass strings in place neatly and efficiently. As a special appointment, this guitar features an engraved 'Limited Edition' neck plate marking it as a special instrument. These are only available in very limited quantities and are destined to become truly sought-after collectibles.